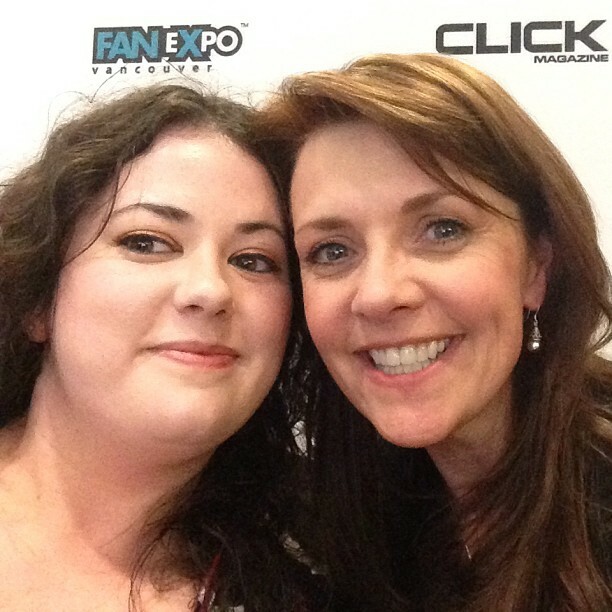 My interview with Amanda Tapping was an interview I was the most nervous about. I love this woman, I have seen everything she has done, other than Space Milkshake which I am DYING to see as I am a HUGE Red Dwarf fan (you didn’t think my nerd-dom went that far back did you??). I know that was one of their sources of inspiration for the movie. But I am a massive fan of her mainly for her strong characters and amazingly sweet demeanor. You can tell just by looking at her that she spreads happiness wherever she goes, she is someone who constantly finds and creates goodness. And if you can believe it she is more gorgeously perfect in person than she is on TV. No joke she is walking perfection. So when my time with her was slowly inching closer and closer I was becoming more and more nervous, my palms were sweaty and I was jittery. Finally sitting down with Amanda right off the bat she was super welcoming, putting me at ease ever so slightly. But I had work to do, I couldn’t just sit there staring at her so I needed to jump in and start asking my questions. We only had 3 minutes after all! Me: “How has being a parent shaped who you are as an actor?? Amanda: “Alot of it! I really love my roles behind the camera and it really makes the projects more mine. Sanctuary was very much a passion project; on a day-to-day basis, from being involved with pre-production I was mapping out the stories for the first season, and doing it again for the second season, white-boarding all the stories, putting together the crew and the cast and the financing. At that wonderful point I shook her hand said soo many thank yous and asked for a picture and she was more than happy to do so!! Gosh I love this woman! Next Post: We Are All Supermoms! Don’t die or anything, but I didn’t know who she was, so I had to look her up…. She sounds like a real down to earth lady! I love that she’ll turn things down so she won’t have to move her daughter. LOL I wont die don’t worry though I am happy I have introduced you she is really awesome!